Wrap Up: Three Days Envisioning The Crypto Future! 17 teams, over 100 participants from all over the world and only three days to co-work and code – the first Blockchain Hackathon, taking place at Merz-Akademie Stuttgart, was all about finding ways of achieving higher transparency and efficiency in real-life cases through Blockchain technology. The event organized by the business initiative bwcon, was aimed at sensitizing businesses in different industries for the innovative potential of the pioneering technology. In the course of the event the participants were challenged to envision applications of Blockchain aside from the current hype – the crypto currencies. The decentralized database responsible for the breakthrough of bitcoin, ripple and co. is based on a network of independent servers where information is stored multiple times, while being accessible to every user at any time. As a result, transparency and integrity of the data is extremely high, making the technology applicable to challenges in a variety of different areas. 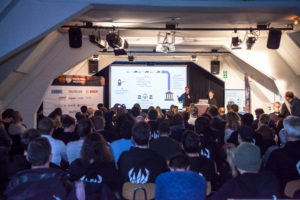 The 1st Blockchain Hackathon Stuttgart was structured around the motto “Envision the Crypto Future” with a focus on linking the topics Fintech and Industry 4.0 with the vision of the Internet of Things. The three sponsors Daimler, LBBW and Bosch awarded prizes to the top ideas responding to challenges in the areas of mobility, finance and industry. Additionally, the most visionary concept, the best technical implementation, and the most promising business model were honored in the awards ceremony. The expert jury was particularly fascinated by the great variety of fields with application potential. The team “TrustableCam” developed a model inhibiting digital manipulation of image and video material, which could increase reliability of criminal evidence and earned them the prize for the most visionary concept. “Best technical implementation” was awarded to “Transtrans” and their project focusing on the transparency of supply chains in the pharma industry, which has the potential to prevent counterfeit drugs from entering the market. The prototype of “mocence”, a concept focusing on creating incentives for a considerate use of car sharing-vehicles, was announced best business model. 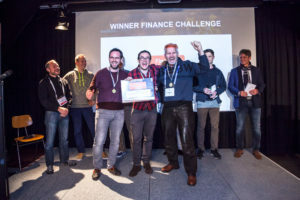 The three sponsor challenges honored the most innovative ideas envisioning more efficient, secure and transparent processes in the relevant industries. One of the winning teams, “VLM-Platooning”, proposed a concept facilitating the communication between autonomous and conventional vehicles. “Decentralized Credit Pool” was able to persuade the sponsors with a decentralized model for bank lending based on a cooperative financing pool. The industry-challenge was awarded to “ChainReaction” and their prototype of an automatized process handling machine malfunctions.